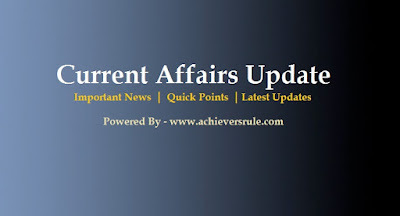 As per our expert Analysis, Many Peoples wants to Read Daily Current Affairs Update With Complete Details. From last 3 months we are continously providing Current Affairs In-shorts. 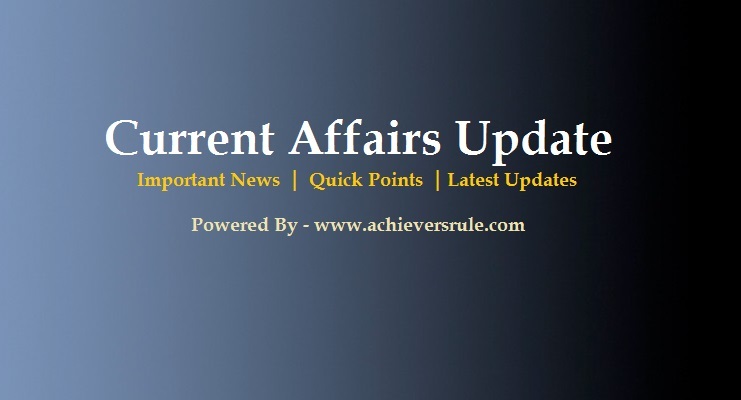 But, Now we are going to change the pattern of Daily Current Affairs Update, from now onwards we will provide you Current Affairs Update with Complete Details. 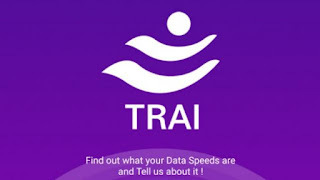 The three new apps -- Mycall app, MySpeed app and 'Do not disturb (DND 2.0)' app are being launched so that there is more transparency between the consumers and the service providers. 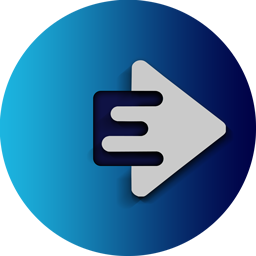 For instance, the MyCall app, is an Android application for crowdsourced voice call quality monitoring. The application will help mobile phone users rate their experience about voice call quality in real time and help TRAI gather customer experience data along with Network data. The operation and maintenance responsibilities for the Habibganj railway station have been given to Bhopal-based Bansal Group for a period of eight years. The Narendra Modi government and Indian Railways are betting big on the Habibganj railway station, which they plan to turn into a world-class facility by March 2020. Habibganj is set to become a swanky commercial hub with shops, offices and hotels, all in a span of three years. The RBI is observing Financial Literary Week from Monday. Speaking at the launch of the week at RBI’s regional office here, its Director R Subramanian said financial literacy is a must to push financial inclusion. “This year, we have selected the themes of KYC (know your customer ), exercising credit discipline, grievance redress and going digital as part of the financial literacy week,” he said. 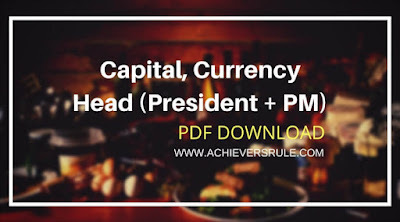 The RBI introduced financial literacy week last year in order to create large-scale awareness on key topics. 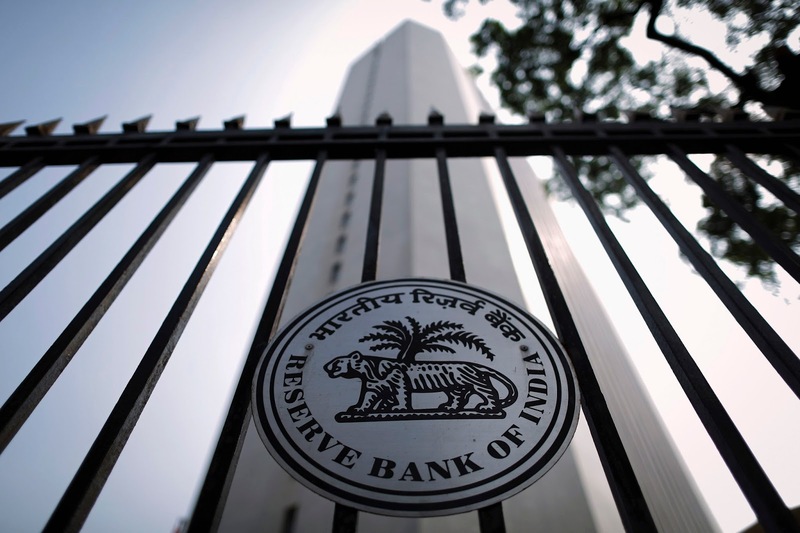 The RBI will be piloting an initiative where non-governmental organisations will be collaborating with banks to extend outreach through innovative and participatory methods at the block level, he added. TATA Projects has announced the launch of Green Thumb, an initiative to enhance the green cover. 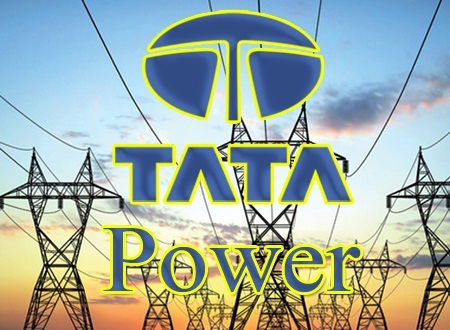 This new initiative of the infrastructure company coincides with World Environment Day and is in continuation of TATA Projects’ programme last year aimed at getting 10,000 people to click (pledge) to plant a sapling on their behalf. It received responses from 23,000 people. TATA Projects planted over 42,000 saplings across over 100 locations during 2016-17. This year, under the initiative, while the company plants the trees, citizens who wish to do their bit to save the environment, can express their support for the cause. US was "pushed out" of the top three slots while Hong Kong consolidated its dominance of the annual rankings for the second year in the list compiled by the International Institute for Management Development's (IMD) World Competitiveness Center. Switzerland and Singapore were ranked second and third respectively, with the USA at the fourth spot - its lowest position in five years and down from third last year. Others in the top 10 list include Ireland at 6th, Denmark 7th, Luxembourg (8th), Sweden (9th) and UAE at 10th. District Collector Vivek Yadav said this at a press conference on Saturday. He said a selection committee at the Centre had selected the district for the award after field verification. 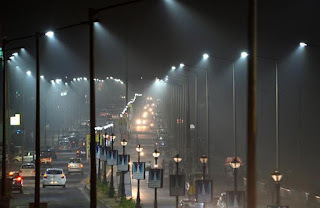 Energy Efficiency Services Ltd has initiated a French agency funded project to retrofit 10 lakh conventional street lights with LED lights in Gram Panchayats of 7 districts in Andhra Pradesh. The entire capital cost of this project is being funded by French Development Agency, Agence Française de Développement (AFD). Under the project, EESL has agreed to carry out the entire annual maintenance and warranty replacement in these gram panchayats for a period of 10 years. When installed, these lights will help save ₹88.2 crore per annum. Andhra Pradesh was the first state to seek assistance from EESL to replace conventional street lighting with LED lighting in Visakhapatnam, after the cyclone Hudhud caused extensive damage. Isro’s latest satellite launch—the GSAT-19 onboard the GSLV MK III rocket—is its heaviest payload yet, demonstrating its capability to hurl next-gen satellites into orbit and carry astronauts to outer space. 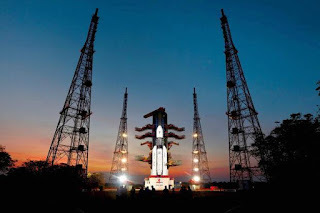 The Indian Space Research Organization (Isro) launched its heaviest rocket— the GSLV MK III—to put the GSAT-19 communications satellite into orbit, in a demonstration of its capability to hurl next-generation satellites into orbit and carry astronauts into outer space. 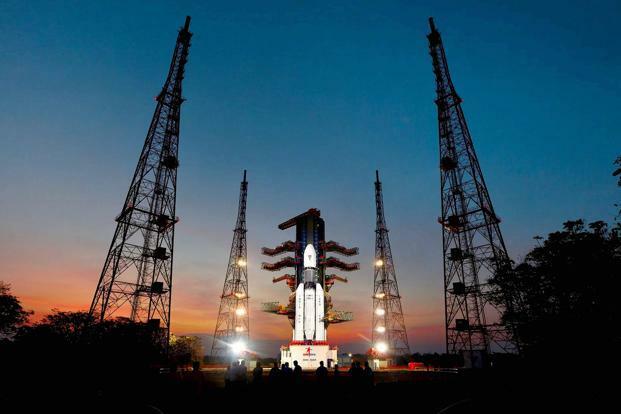 At 5.28pm, the 43m, 640-tonne geosynchronous satellite launch vehicle (GSLV) Mark III (D1), lifted off from the Satish Dhawan Space Centre in Sriharikota in Andhra Pradesh. The rocket’s mission was to place the 3,136kg GSAT-19 communications satellite into a geosynchronous transfer orbit (GTO) at 36,000km above earth. The successful first developmental flight opens up commercial opportunities for Isro to launch heavy satellites for foreign customers besides reducing its own dependence on foreign space organizations such as Arianespace SA. It demonstrates Isro’s ability to launch satellites weighing as much as 3.5-4 tonnes, up from 2.2-2.3 tons in the past. “The GSLV-MKIII D1/GSAT-19 mission takes India closer to the next generation launch vehicle and satellite capability. The nation is proud,” Prime Minister Narendra Modi wrote in a Twitter message. President Pranab Mukherjee shared some kind words for saint, poet and social reformer Lalan Shah Fakir on receiving the first copies of his book ‘Lalan Shah Fakir Ke Geet’ written by Prof. Muchkund Dubey and DVD of selected songs over the weekend. 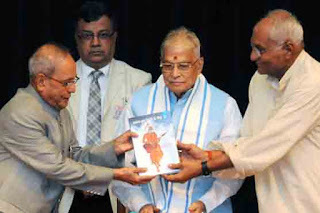 President Pranab Mukherjee also said there is hardly any Bengali who does not know the songs of saint, poet and social reformer Lalan Shah Fakir who is among the luminaries of saint poets – particularly of the Bengali speaking region. The President said poet laureate Rabindranath Tagore was the first to publish a significant number of songs of Lalan Fakir and played a central role in bringing Lalan Fakir’s compositions to a wider audience. Today, while Lalan Fakir is an icon and Lalan geeti is in the mainstream of Bengali folk music in Bangladesh, at the same time, he is equally regarded and celebrated among Bangla knowing people of India. The President further added that Lalan Fakir is considered one of the most profound thinkers as he picked up the best from Vaishnavism, Sahajya Buddhism and Sufism instead of depending on any one religion and ideology. 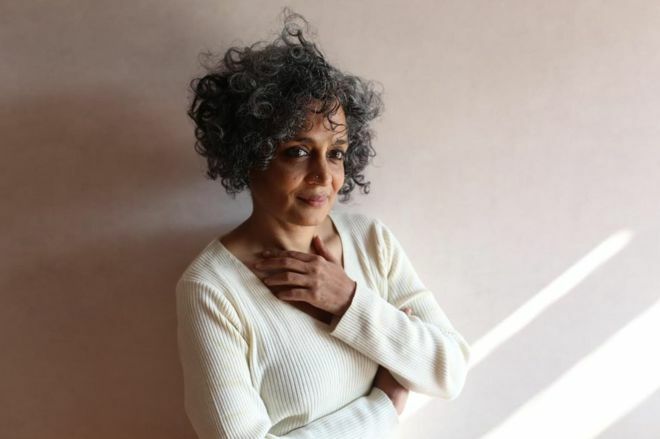 Arundhati Roy’s eagerly-awaited second novel goes on sale worldwide on Tuesday, two decades after her prize-winning debut The God of Small Things propelled her to global fame and launched her career as an outspoken critic of injustice in her native India. Roy became the first Indian woman to win the prestigious Booker Prize with her 1997 work, which sold around 8m copies and turned the young author into a star of the literary world. The charming actress Dia Mirza, who is best remembered for her role in Rehnaa Hai Terre Dil Mein, has been appointed brand ambassador for the Wildlife Trust of India. The actress was given the coveted title by the WTI officials on World Environment Day. Dia has always been promoting conservation of nature through her celebrity status before a wider, more mainstream audience. 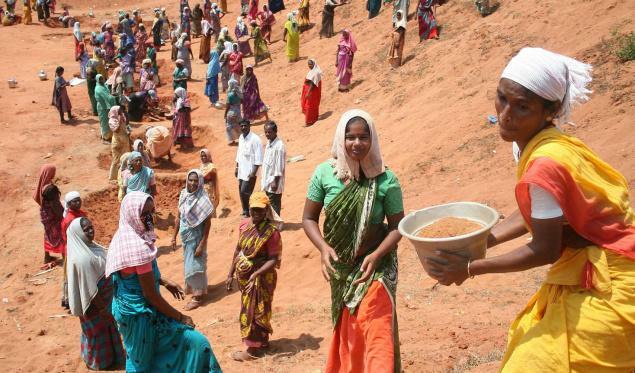 She has been a part of many pivotal environmental and humanitarian campaigns. Last year she was appointed brand ambassador for the Swachh Bharat Mission's Swachh Saathi programme. 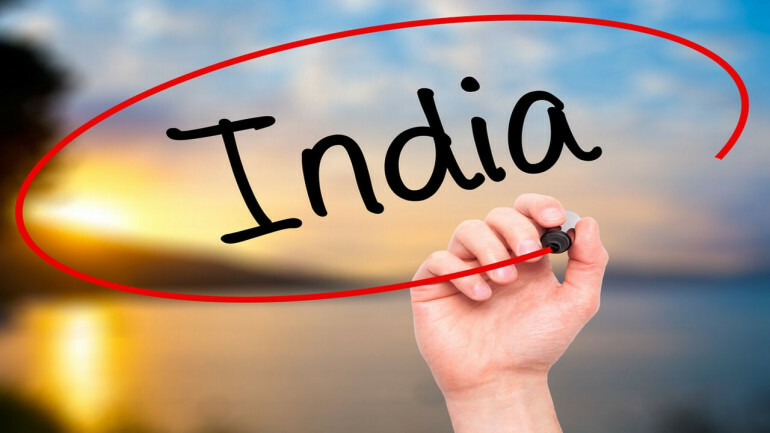 India has surpassed China to secure the top position among 30 developing countries on ease of doing business, according to a study that cited India's rapidly expanding economy, relaxation of FDI rules and a consumption boom as the key drivers. 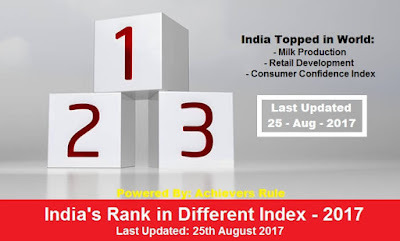 India's rapidly expanding economy, easing of foreign direct investment (FDI) rules and a consumption boom are the key drivers for India's top ranking in the GRDI. The GRDI, titled 'The Age of Focus', ranks China in second place. Despite its slower overall economic growth, the market's size and the continued evolution of retail still make China one of the most attractive markets for retail investment. "The study is unique in that it not only identifies the markets that are most attractive today, but also those that offer future potential," said the management consulting firm A T Kearney in a statement. 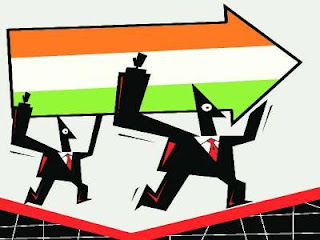 India's retail sector has been growing at an annual rate of 20 per cent. 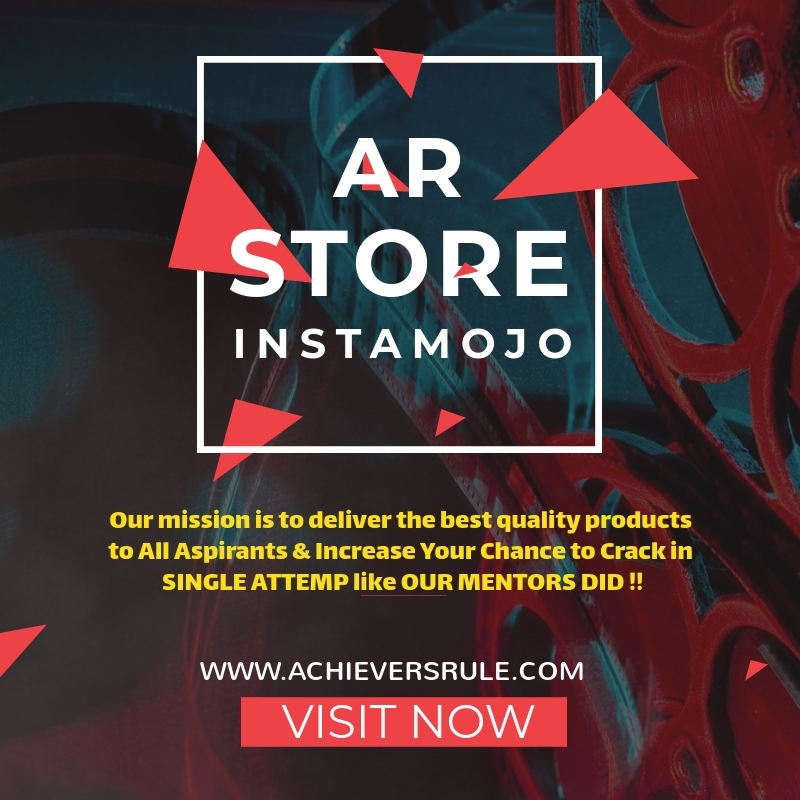 Total sales surpassed the $ 1 trillion-mark last year and the sector is expected to double in size by 2020.